The following several photographs turned up on a Chinese language blog this morning. 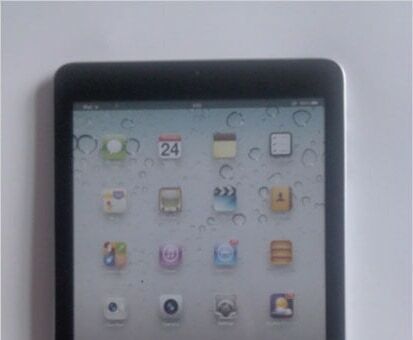 The look an awful lot like the many other leaks for the iPad Mini, thus confirming the widely held belief that the iPad Mini will have a 7.85" screen. As you can see it has the docking port, rear camera, and 2 speakers that have shown up in past leaks. But it also has an oddity on the base of the home screen. Do you see the 3 icons? That is rather interesting because the iPad defaults to 4 icons. But you can add or remove the icons, so it's not impossible that this iPad Mini was customized by the user. If anything, this detail makes these iPad Mini photos more credible, not less. So I would guess that this is proof that the iPad Mini does exist, and it seems a near certainty now that we'll see it launched in October. I will be ready to buy one, definitely. I was curious why you believe these leaks and not the others this year that put your mini prediction launch of next year. I do not have a good eye for photo shop fakes. Do you mean why do I believe the leaks now but not earlier? It has to do with the quantity and the type of leaks. With past Apple products the leaks tend to spike not too long before the launch, and in this case we’re seeing more leaks of photos which could be the real iPad Mini. That moves the October launch from a possibility to a probability. Yes, how can you spot the fakes. I sure can’t. I’m sure it comes with a lot of experience. I am new to the site here, but i was thinking you were an Android guy with your tablet preference. Reading you will buy a mini I was off. I sure enjoy your site and have learned a bunch here. I often times cannot spot the fakes. Th main reason I am assuming this one is true is that there have now been a bunch of similar leaks. This looks like a mock-up to me. It appears as though the screen is either very low quality, which is unlikely for an Apple product, or the screen is actually a plastic sheet. I’m still shocked we didn’t see a new New iPad with a Lightning connector. iPad intros are in the spring. The next iPad will get lightning then. As for the baby pad resolution looking low quality, well it might be an artifact of the camera (a phone most likely) or it might simply be accurate; an 8in XGA tablet isn’y going to be anywhere near Retina quality. The iPod Touch (iPad Original!) has a Retina screen, so it’s not the size. Though I think Nate has suggested that Apple would keep this back as an upgrade for the next model. iOS 5 as depicted by the maps icon? If this is what the Mini will look like, I think it looks nice. I am more excited about the iPad Mini than anything else they have already announced. I have been looking for a smaller tablet that I can carry around with me, and not be weighed down with. I have been hearing about the iPad Mini for weeks from a co-worker at Dish and now I can’t stop looking for whatever information I can find on it. I really just want it to be able to take it with me out of the house, especially with all the new shows and new fall season coming up shortly, to watch live TV on the Dish Remote Access app so I don’t have to miss any of the shows this season. I know the price will probably be more than the Nexus 7 or Kindle Fire, but I am sure it will be worth it. I hope the release is very soon.